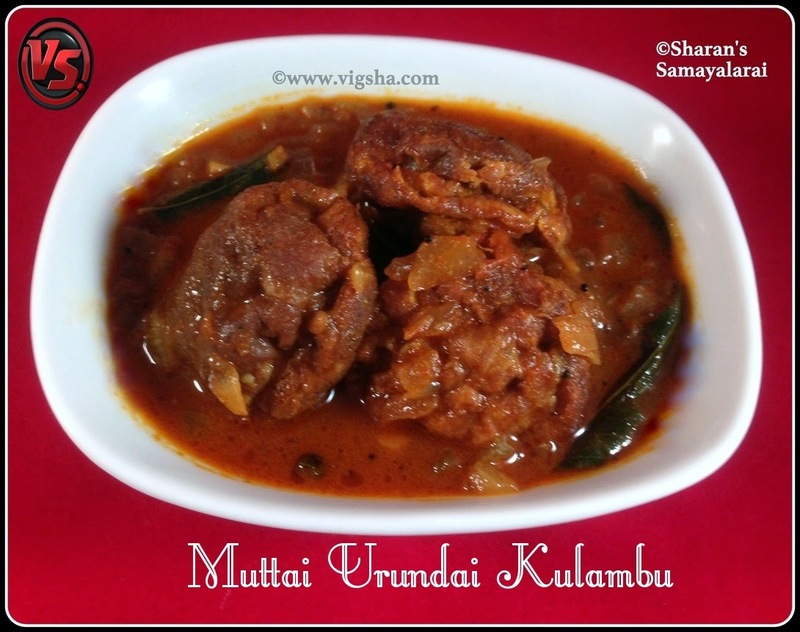 Egg Urundai Kulambu is a simple south Indian style gravy. This delicacy is prepared using egg masala dumplings that are drowned and cooked in tamarind gravy. 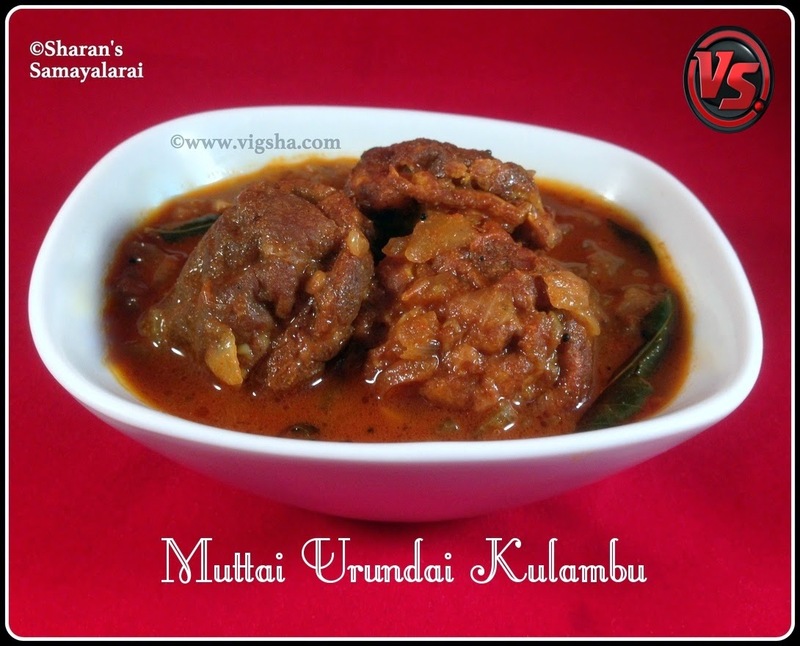 This is similar to Paruppu Urundai Kulambu with little variation. This gravy goes with steamed rice. Check out other egg recipes which I have already posted :- Egg Fried Rice, Muttai Kuzhambu, Egg Dosa, Egg Masala, Egg Noodles, Egg Podimas (Scrambled egg), How to peel hard boiled eggs. This recipe is a special dedication to my Dad on his birthday. To him, nothing is important in this world than Me ! I always feel like a child when I am with him. No matter how old I grow, I will always be his little girl :) I feel so blessed to have such loving parents who pamper me always !! 1). In a mixing bowl, beat the eggs and add onions, red chilli powder and salt. Using this egg mixture, prepare egg urundai in paniyaram pan. Cook till it is fully cooked on both sides and turns light golden brown. Keep aside. 2). Heat oil in a pan, add mustard, fenugreek and let it splutter. Then add curry leaves, garlic and onions, saute till onions turns light brown. Add tomatoes and saute till it becomes soft. 3). Add the tamarind extract along with red chilli powder and coriander powder. Let it boil till the raw smell goes. 4). When it begins to boil, reduce the flame and add the prepared egg balls to the gravy. Egg balls will absorb the gravy so make sure the consistency of the gravy is watery before adding the urundai. Let the gravy cook in medium flame for 5 minutes. Switch off once the gravy reaches thick consistency. Done ! Relish hot with steamed rice ..
# Be careful in turning over after adding the egg balls in the gravy. # Make sure to cook in sim after adding the egg balls. # The gravy thickens after it cools down so adjust the gravy consistency accordingly.